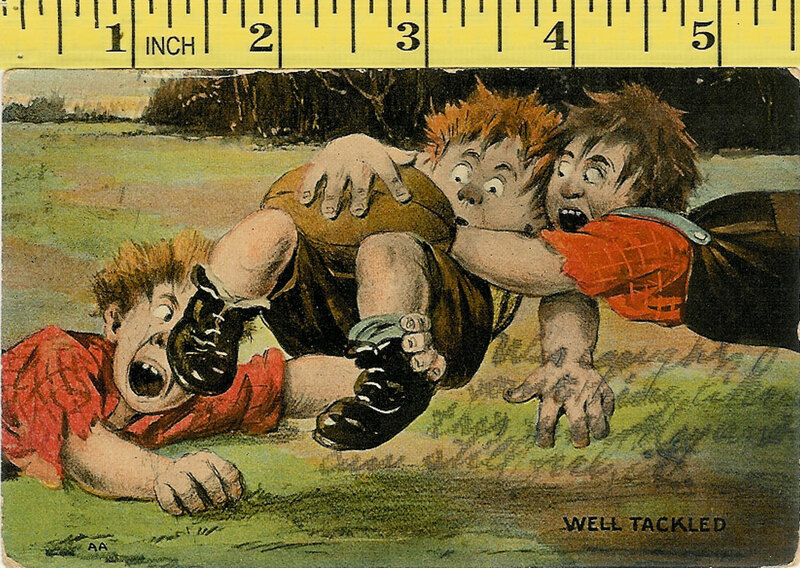 Vintage rugby postcards from around the world, on this page we have a great selection of vintage rugby postcards, please scroll down to see what great cards we have on offer. 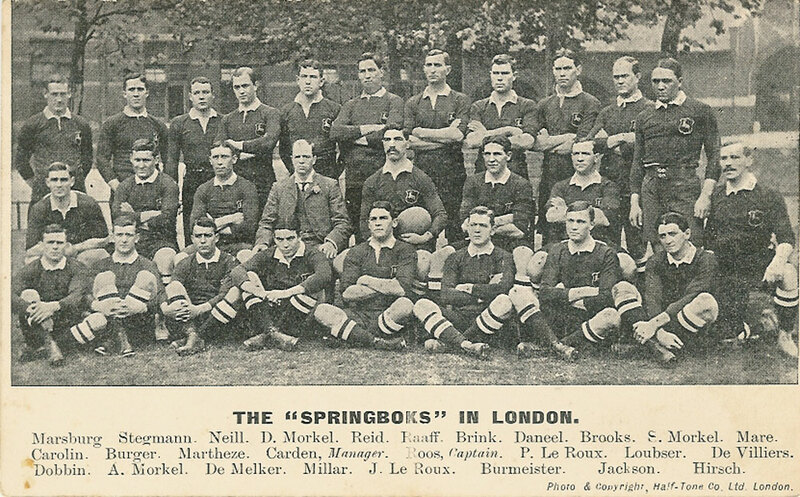 1906 Springboks - The Springboks in London 1906, published by Half-Tone Ltd, London . 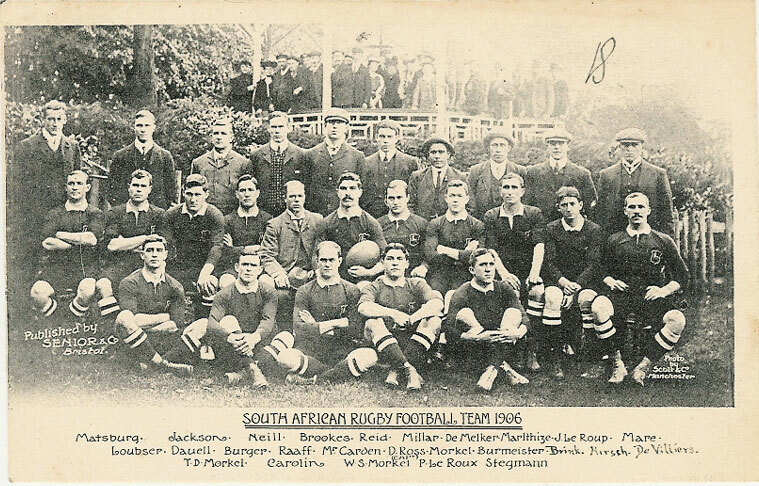 Players names listed below the picture. 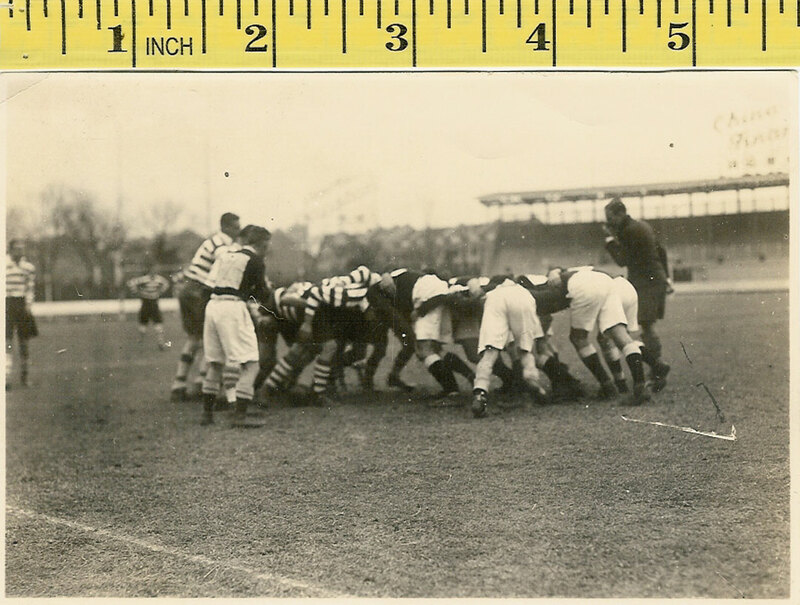 Postally unused, good condition. 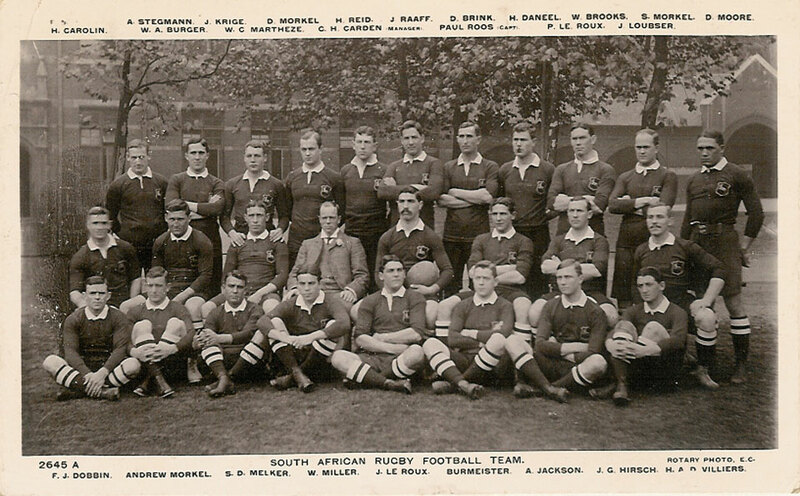 1906 Springboks - Published by Senior & Co, Bristol, a picture of the 1906 South African Rugby Football Team, photo by Scott & Co, Manchester . 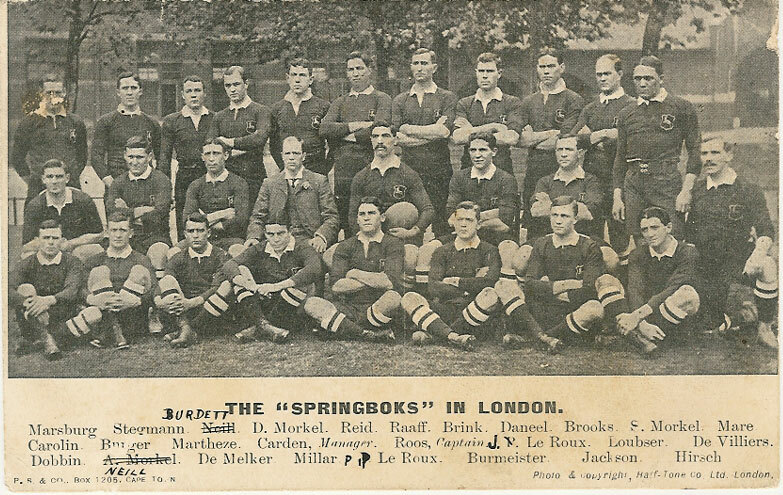 Players names listed below the picture. 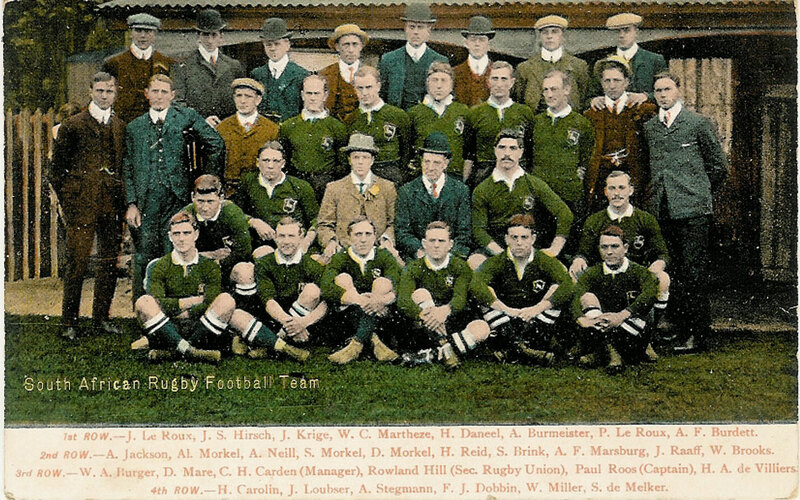 Postally used, dated 23/1/1907 , good condition, but the sender has initialled the front (top right). 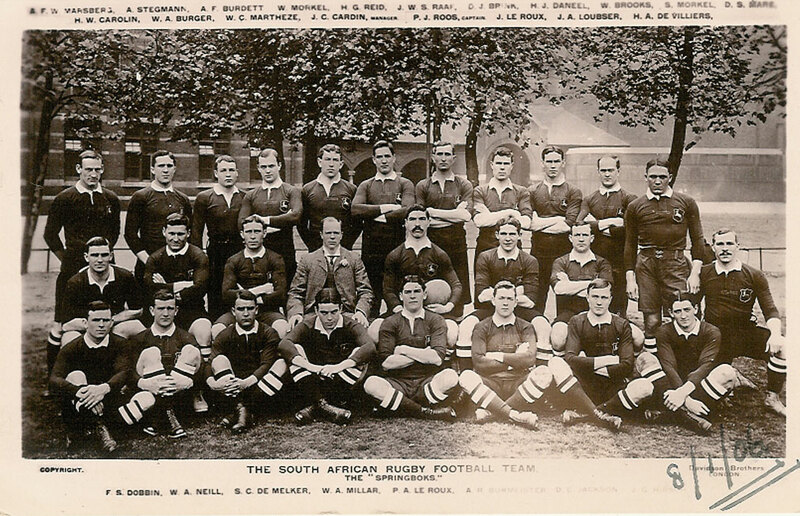 1906 Springboks - South African London won the game 28 points to 3. 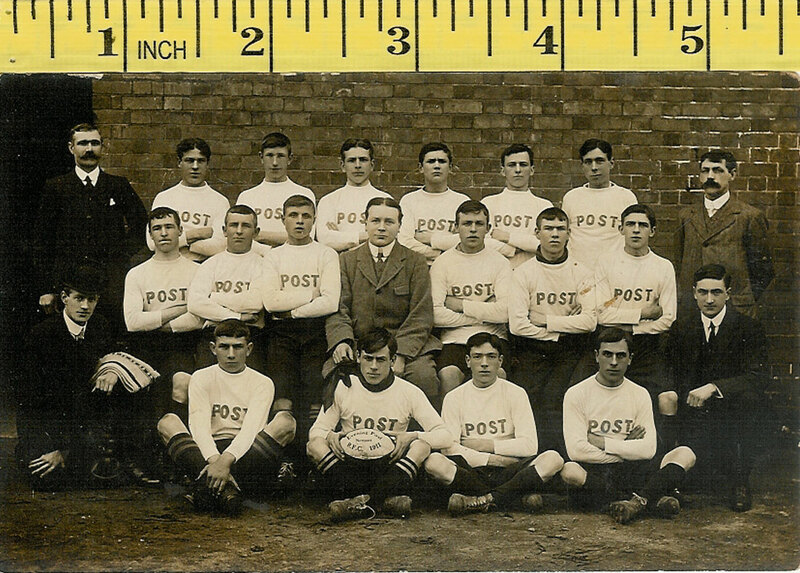 Postally used, date unclear, good condition. 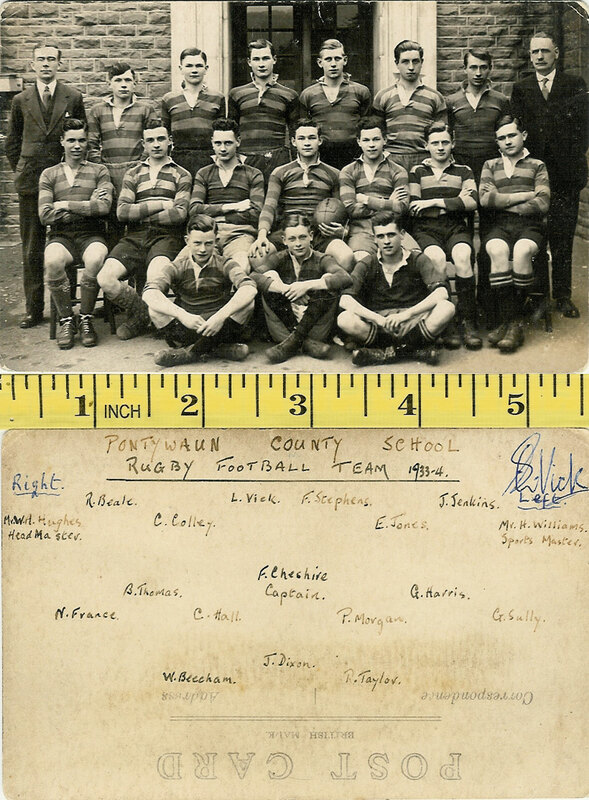 Pontywaun County School Rugby Football Team 1933-4 - players named to reverse including L Vick who has also signed the card. 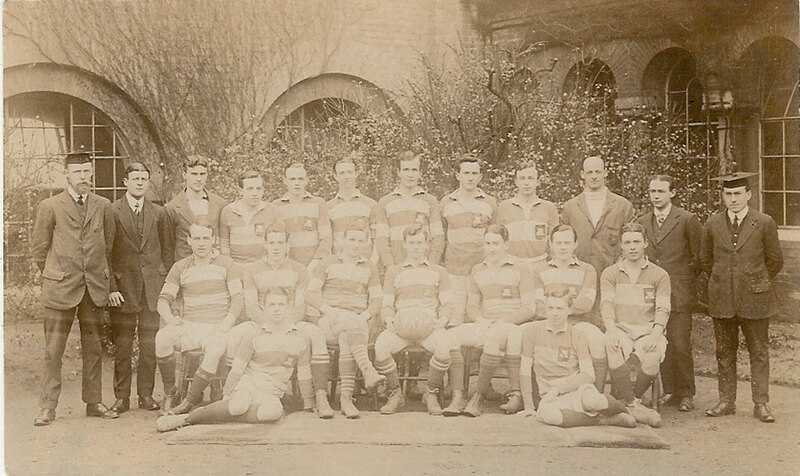 Photograph by LE Muller, London possibly of St Mark's College team 1913-14. 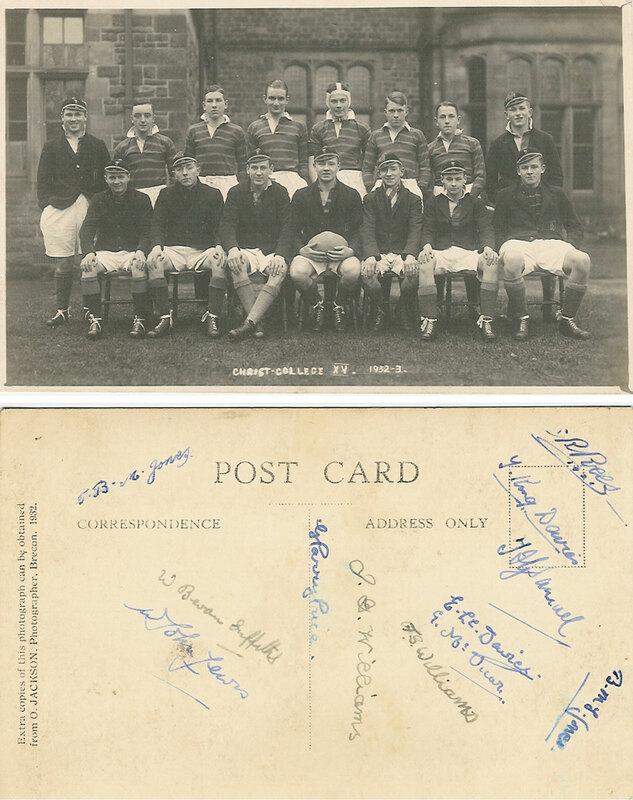 Postally unused, but the reverse is signed RJ Wright, St Mark's College, and is dated 22/3/1914 , good condition. 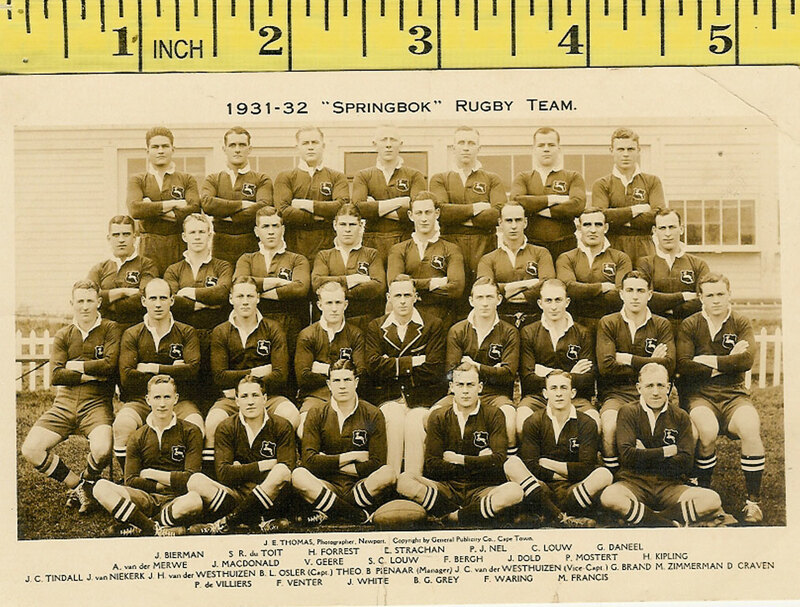 1926-27 Navy Team, RP, ?? 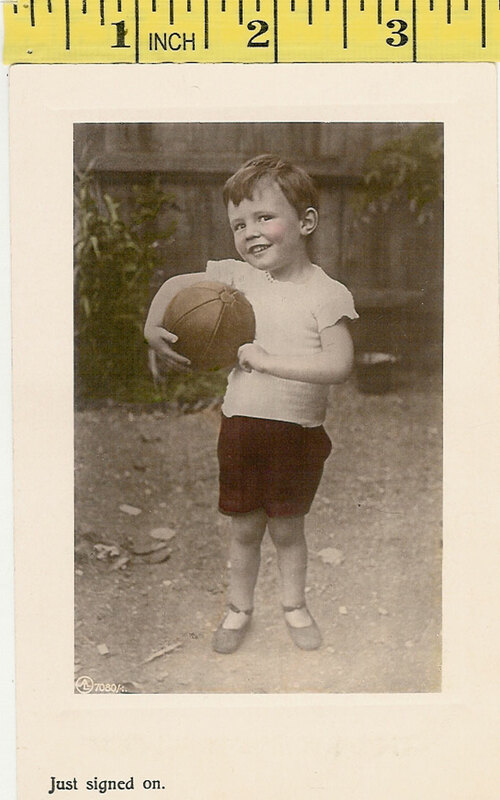 ?Bow (written on ball), postally unused, crease down left hand side. 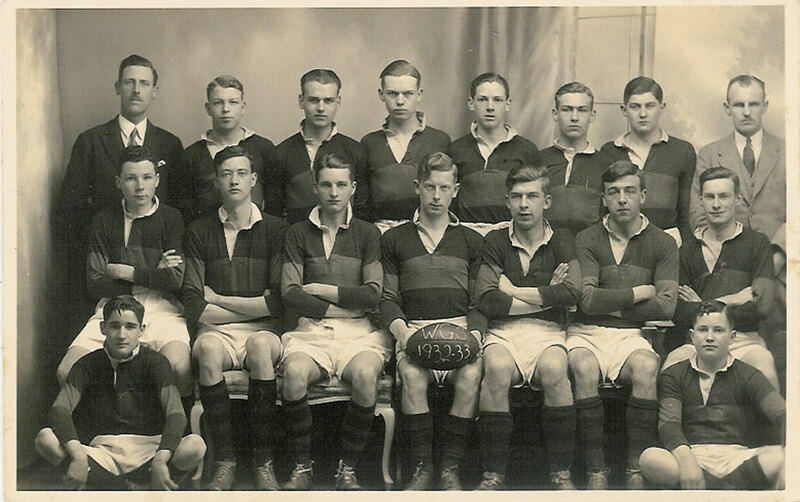 RP of Swansea University Rugby team taken in October 1922. 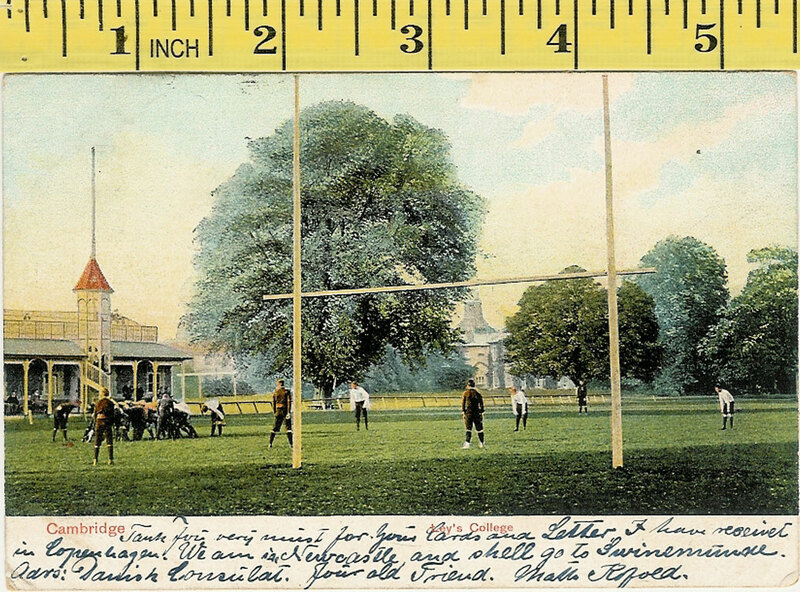 Postally unused, right hand corners are slightly creased. 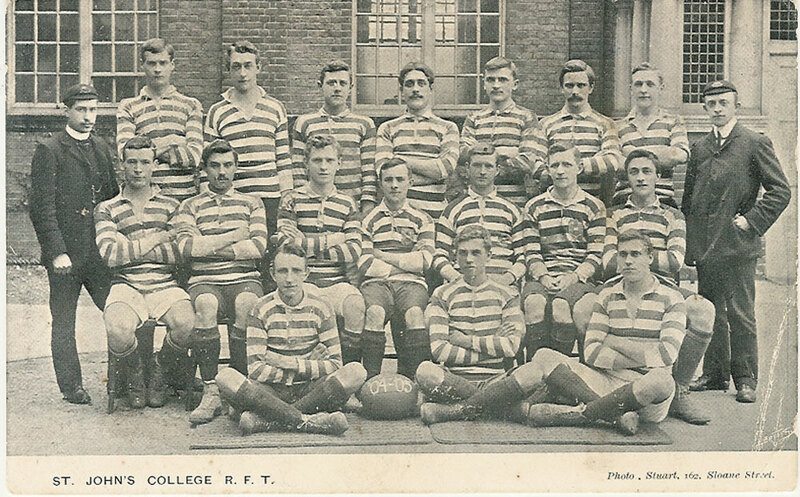 St John's College RFT 1904-1905, photo by Stuart. 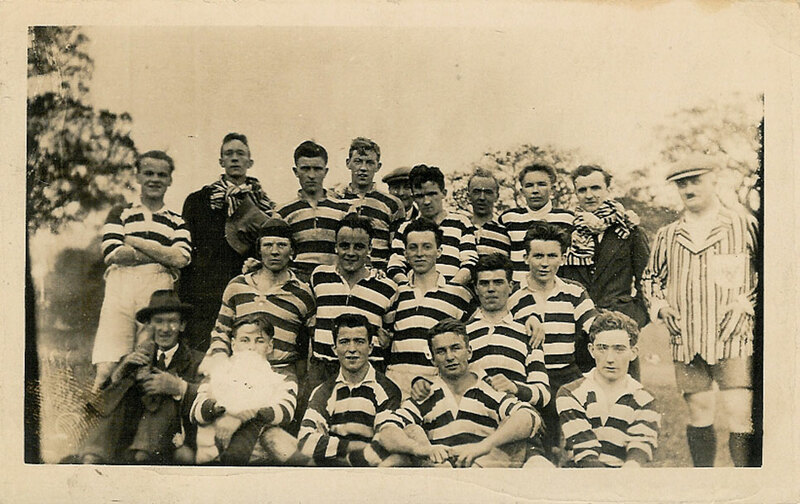 Postally unused, good condition but has a small crease on the bottom right hand corner. 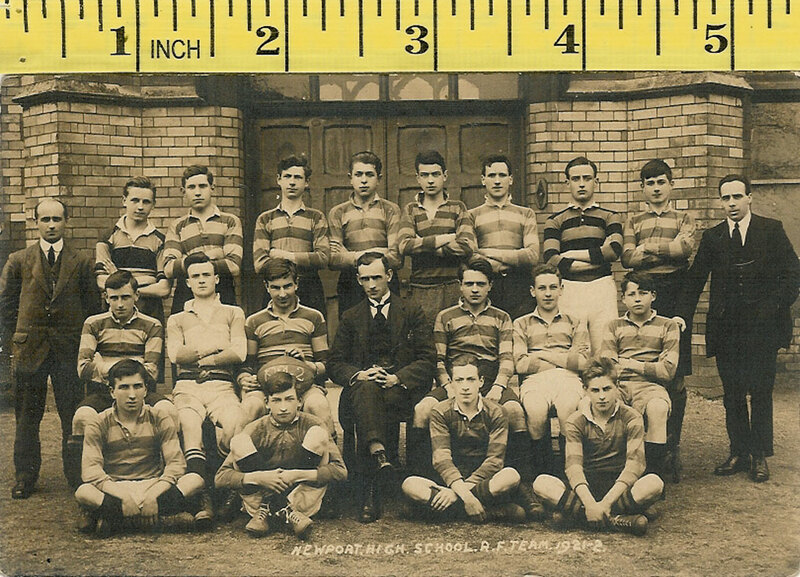 Llanelli County School RFC 1926-7, a real photo postcard by R Clare, Mumbles, from the Elvet Jones (Wales & British Lions) collection, Elvet has signed the card to the reverse, edges worn with 1 small tear, some surface damage. 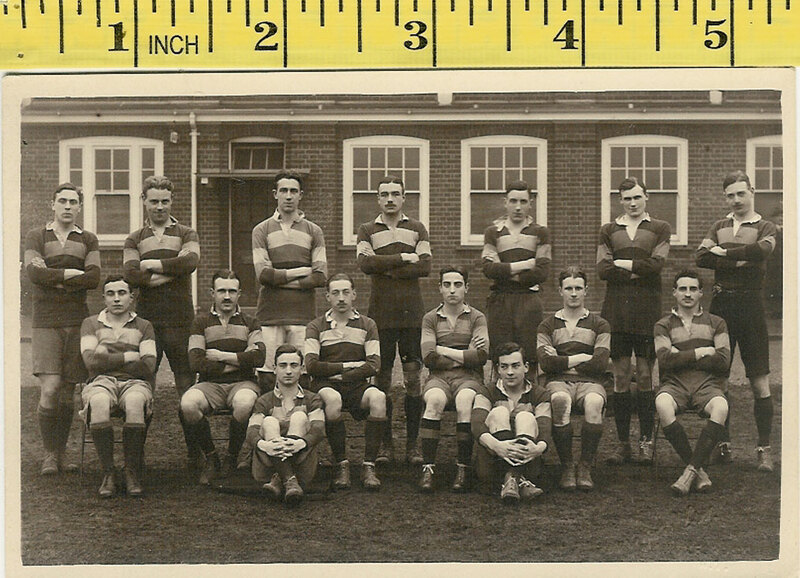 Newport High School RF team 1921-2, unused. 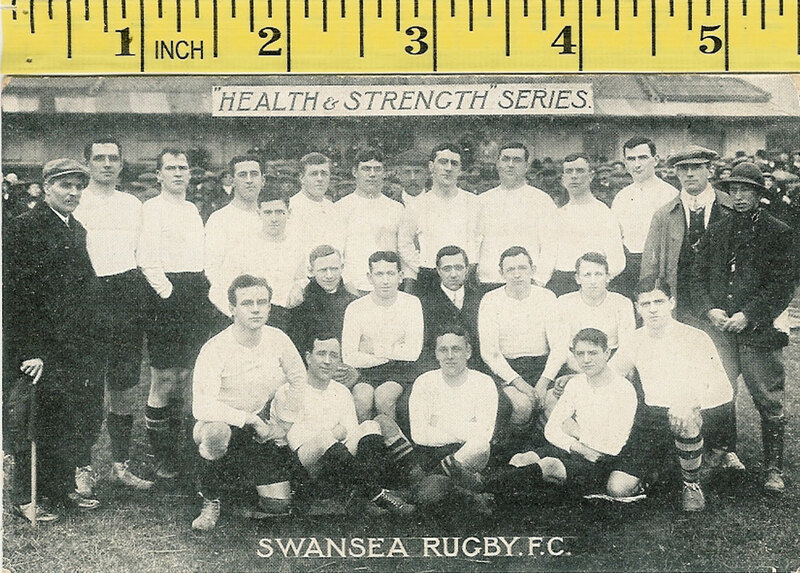 Swansea RFC approx 1909, Willie Trew captain, players named on reverse, Health & Strength series, used but not postally. 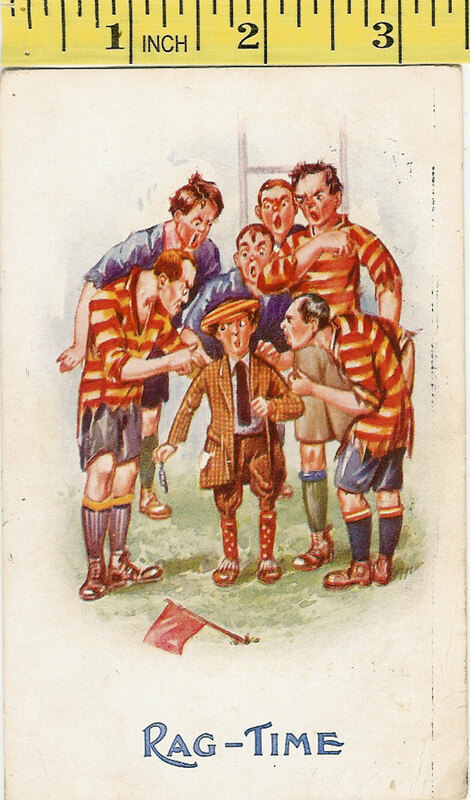 Players and officials featured on this card are W Parker, DJ Thomas, Rev J Alban Davies, H Moulton, Ivor Morgan, G Hayward, FE Perkins, T Morgans, D Davies, T Nicholas, E Davies, A Smith, R Dowdle, Bryn Lewis, Jack Bancroft, Howel Lewis, WJ Trew, P Hopkins, Haydn Evans, WS Goff, R Jones, H Rowe, Dickie Owen, T Wiliams. 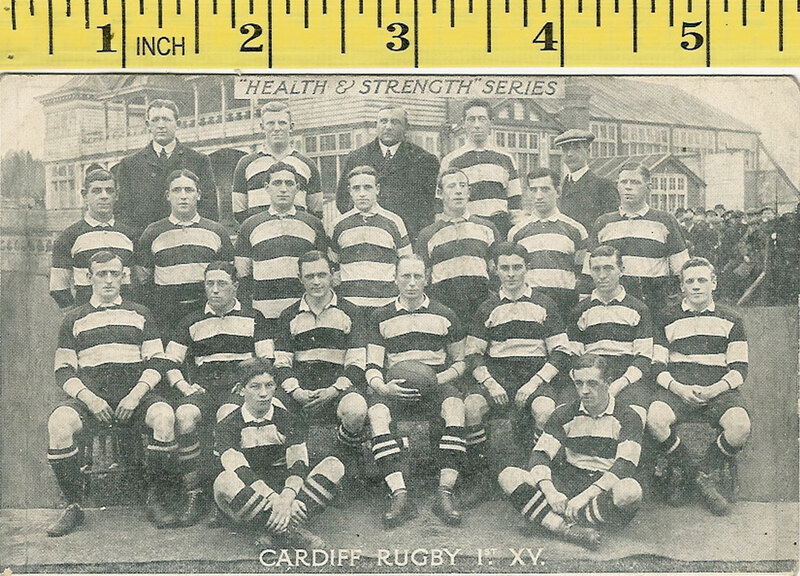 Cardiff 1st XV - Health & Strength Series, approx 1912, RA Gibbs captain, unused in very good condition, some rubbing to reverse. 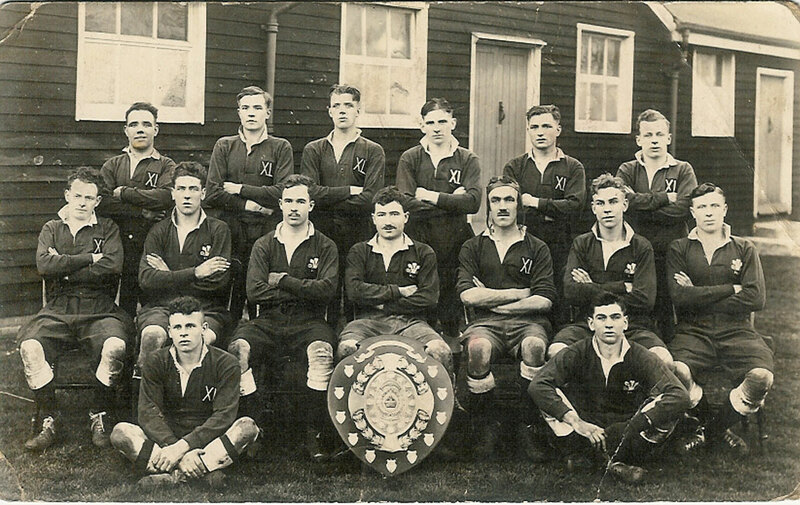 Whitchurch (Cardiff) ex schoolboys 1921-22, unused in excellent condition. 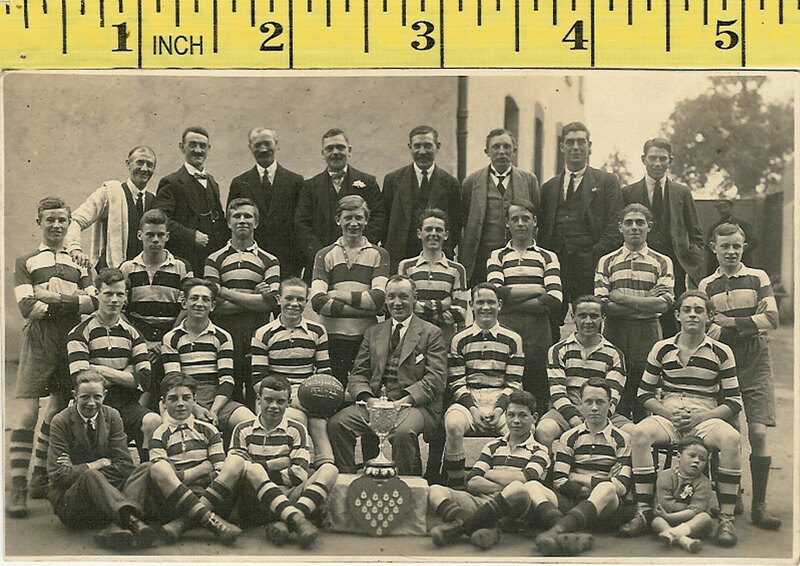 Excellent condition, postally unused. 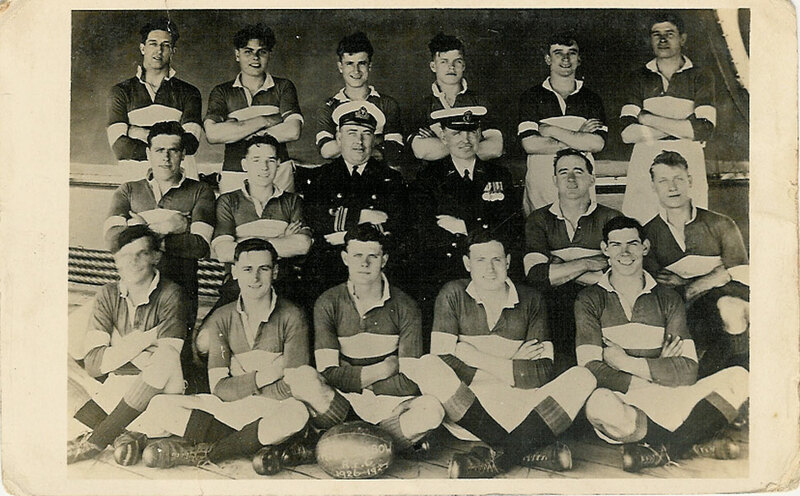 Photograph by Oxford St , London , Studio, unknown team probably military. 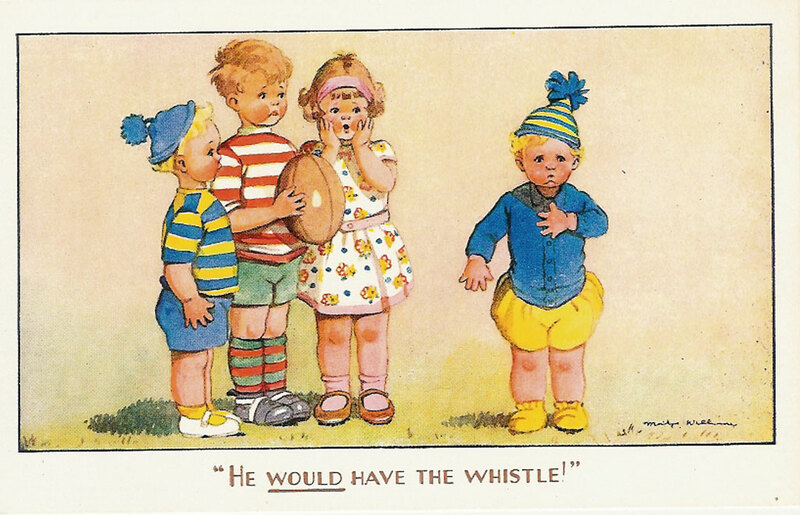 Raphael Tuck & Sons "Write Away" postcard Series No 761, "Sorry I couldn't get away". 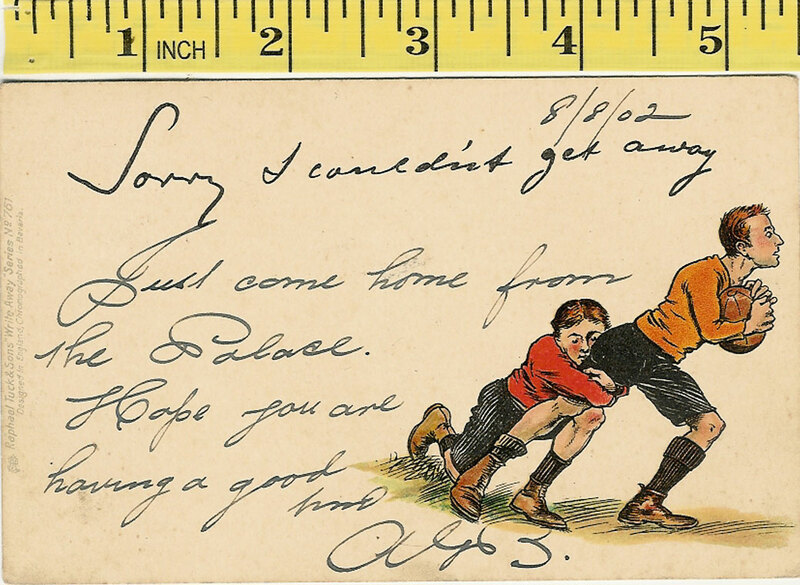 Postally used, dated Croydon 8/8/1902 , good condition, but sender has written on front. "Gran-pop" Series published by Valentine & Son. 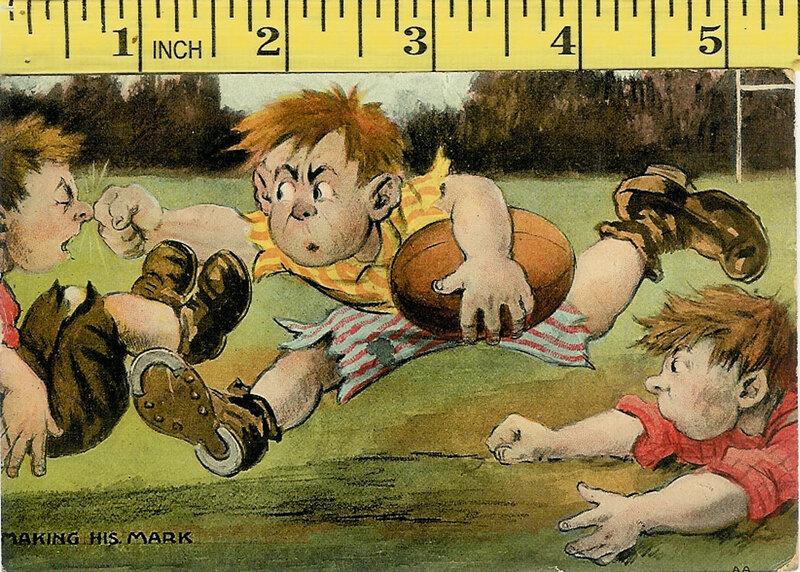 The illustration is by Lawson Wood and called a "hand off" Postally used, dated Lythan St Annes Feb 1943, good condition. 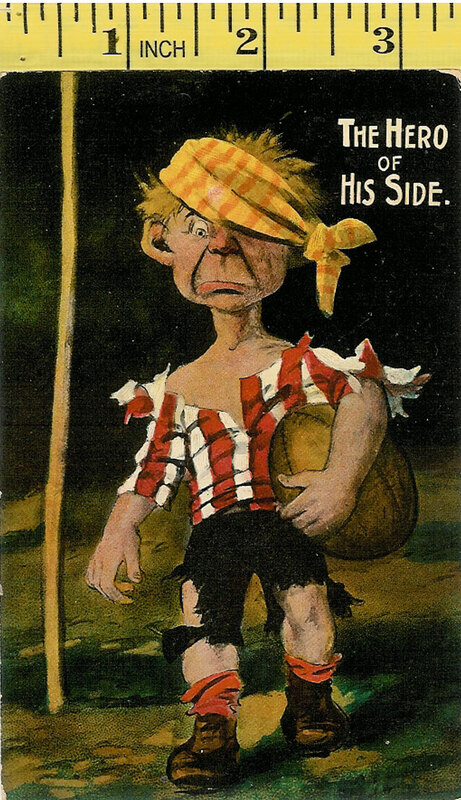 No 501 of the "Rag time" Series published by Bamforth & Co,. 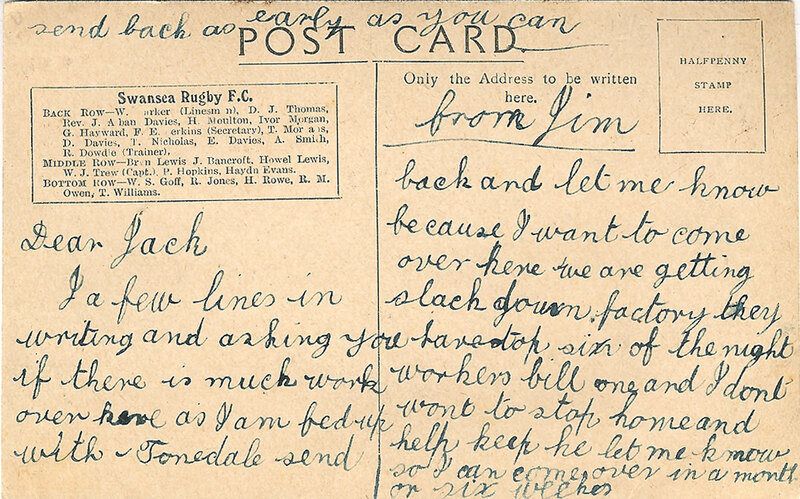 Postally used, dated Wolverhampton 23/6/1913 , there are slight creases in the bottom corners. 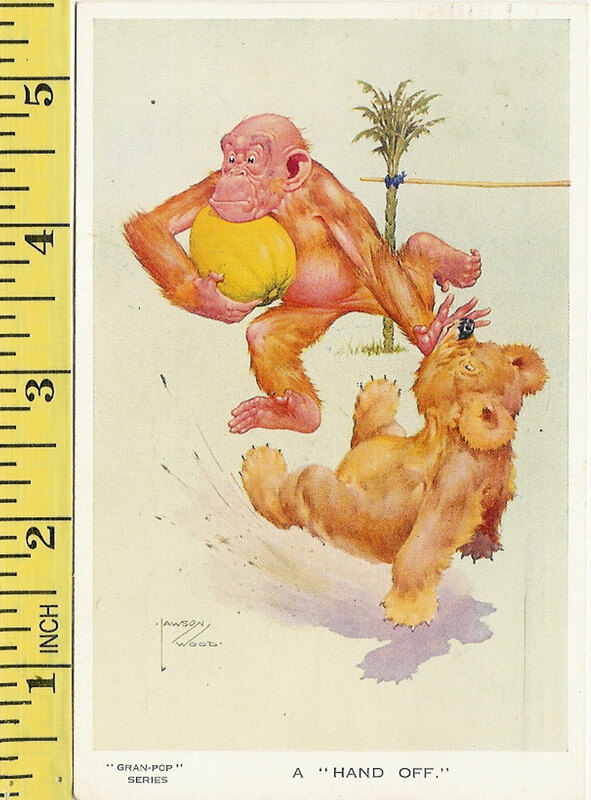 Millar and Lang postcard "well tackled" small crease to top of card and some bumping on corners, postally used. 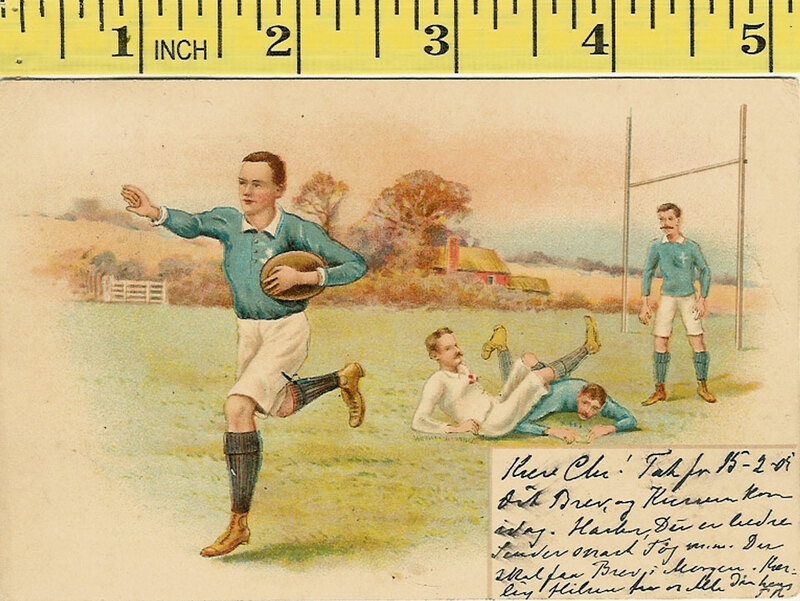 Millar and Lang postcard "The Hero of His Side", some slight chipping to sides, postally used, dated 1909. 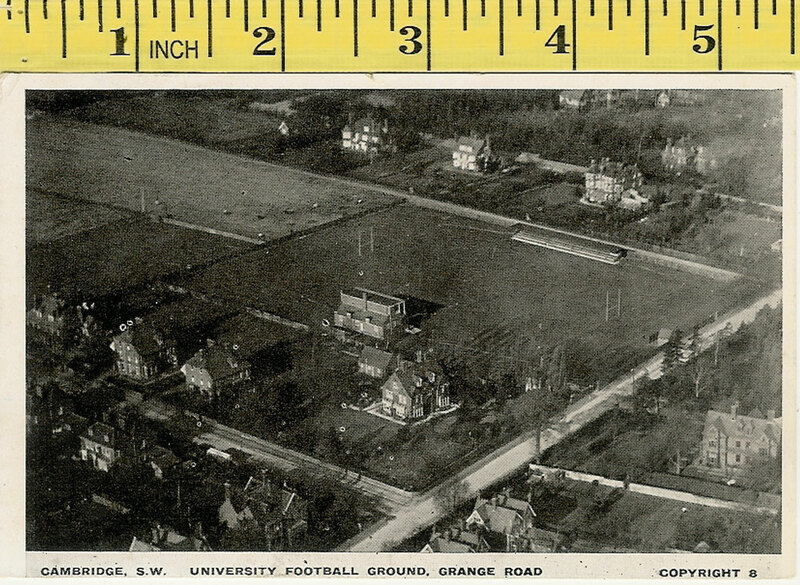 Ariel photograph of Cambridge University Football Ground, Grange Road . 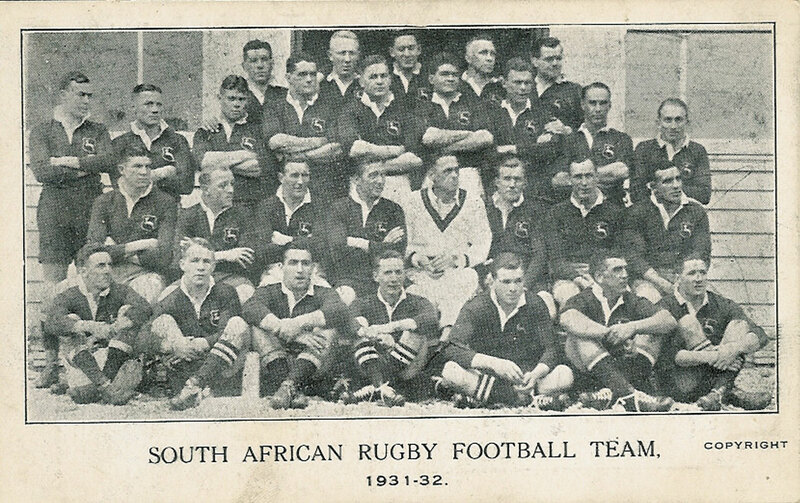 Postally unused, small crease on top left corner, and slight tear at top. French postcard "L ' Auvergne - Cantal 895. Aurillac - Parc des Sports". 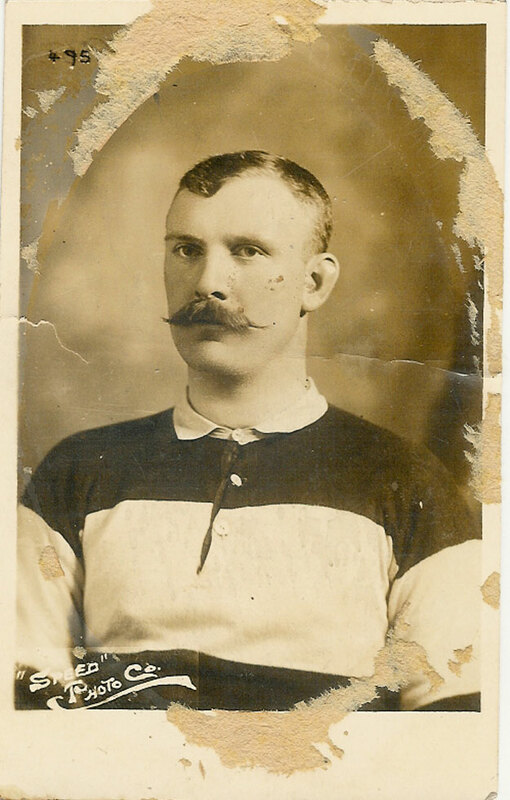 Postally unused, but the back has been written on in French, good condition, corners slightly worn. 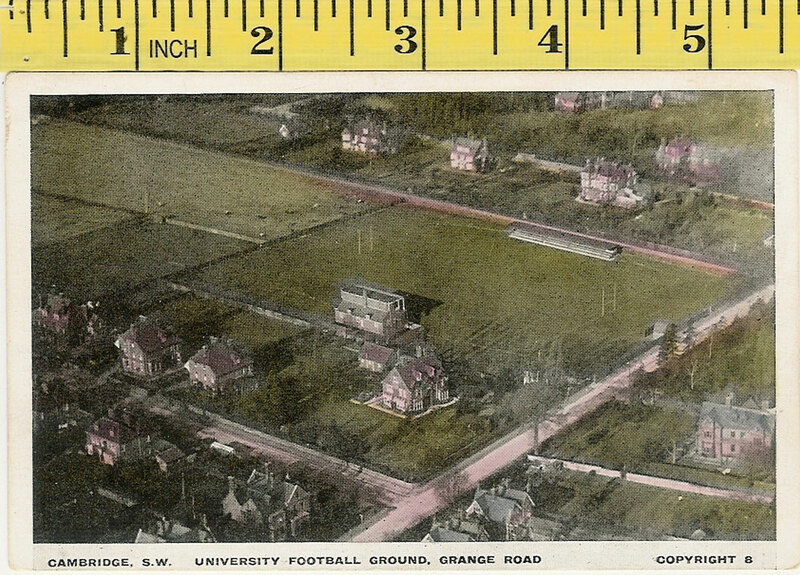 Ariel colour photograph of Cambridge University Football Ground, Grange Road . Published by Metclafe & Co, Cambridge . 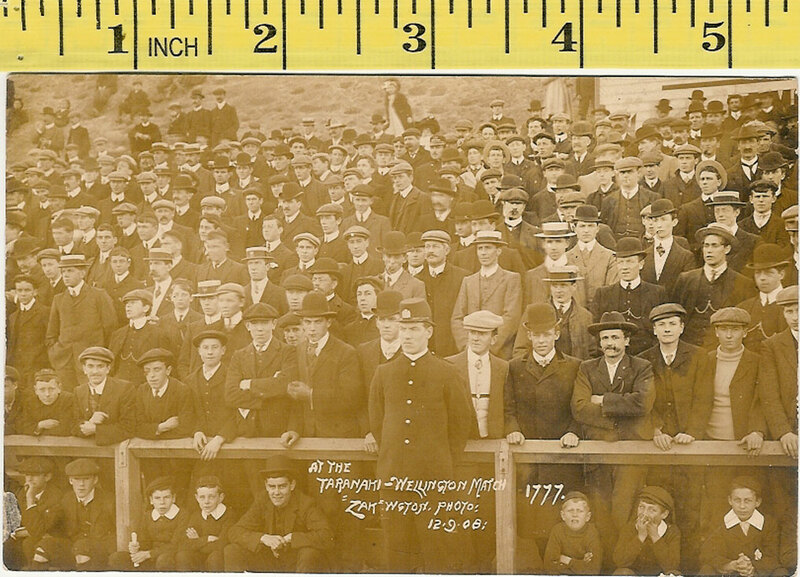 Postally unused, good condition. 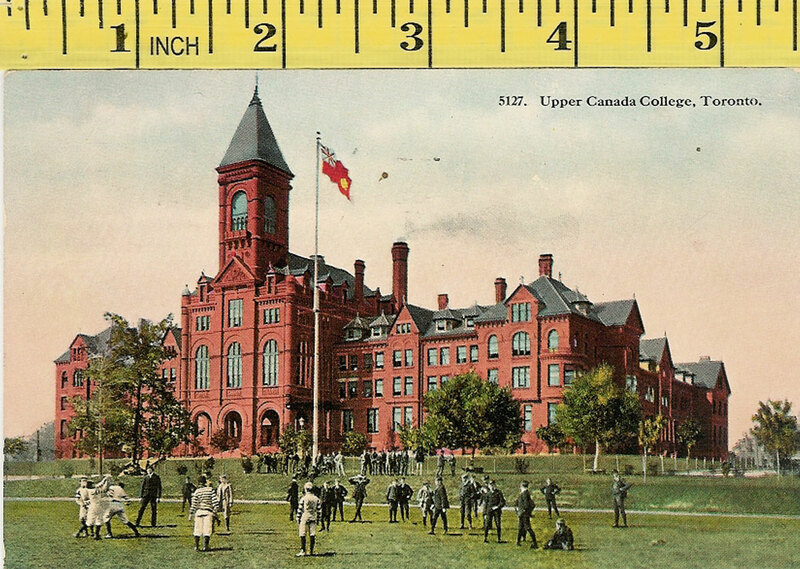 Canadian postcard of Upper Canada College , Toronto . 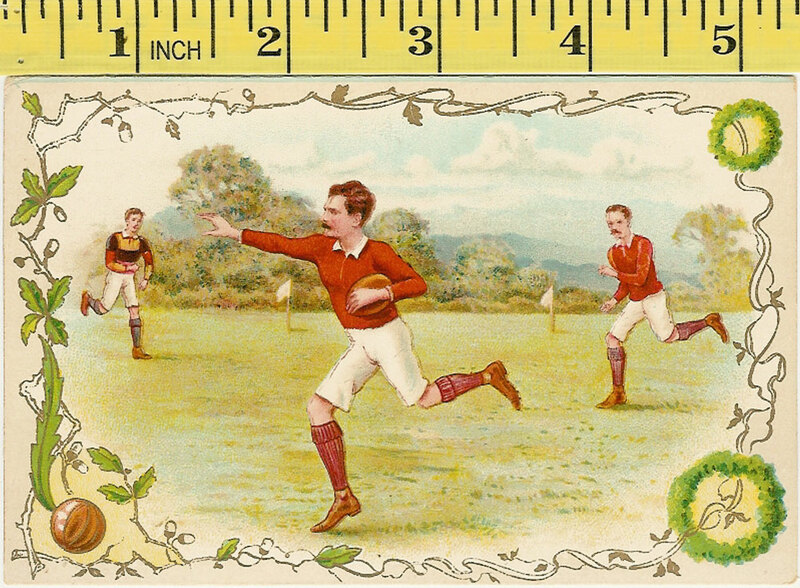 Postally used, dated 28/8/1915 , good condition. 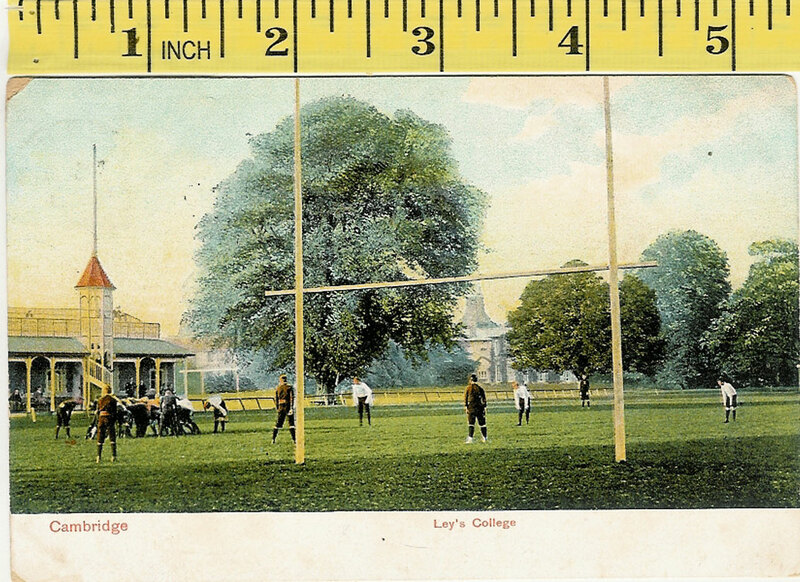 Ley's College, Cambridge , published by HM & Co, London . Postally used, dated Willington Quay 3/5/1904 , sender has written on the front of the postcard, bottom corners are slightly creased. 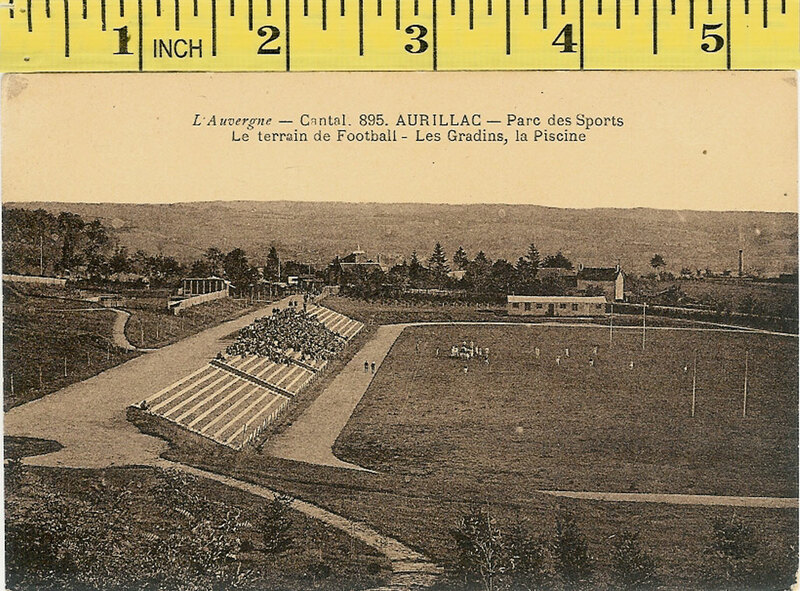 Postcard sized photo - plain back - believed to be a photo of Stade Colombes, approx 1920s, small mark to photo and a small corner fold. "Just signed on" published by Aristophot Co, London . Postally unused, but message wriiten on reverse, excellent condition. 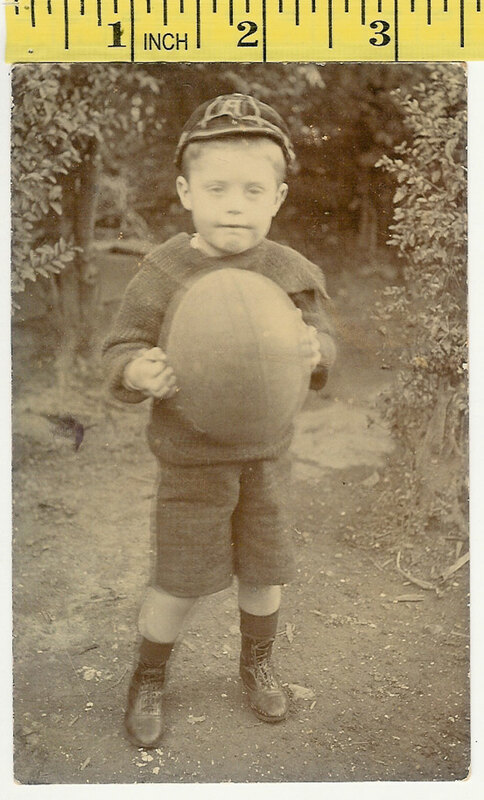 RP postcard of young boy in Cap ('A') with ball, postally used in Auckland, NZ, dated 1906, the cap is probably early Australia. 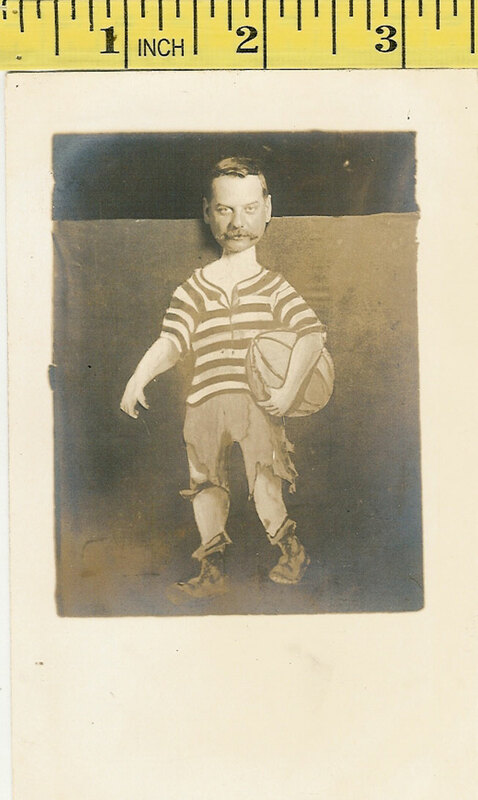 Unknown individual. 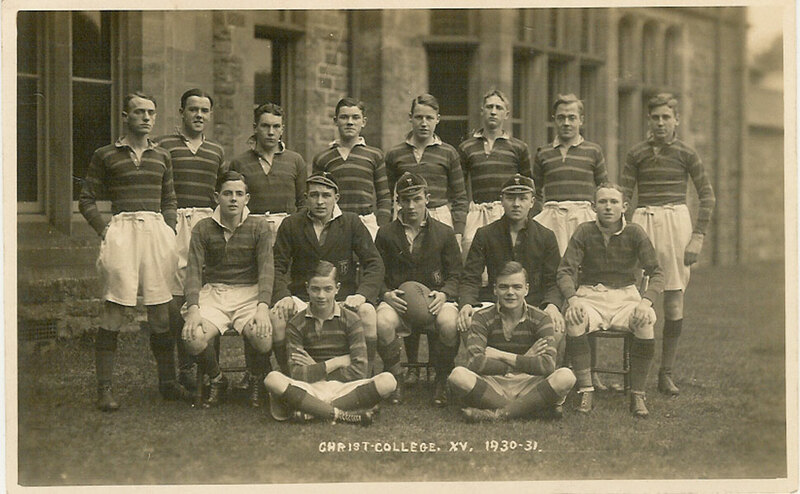 Postally unused, good condition. 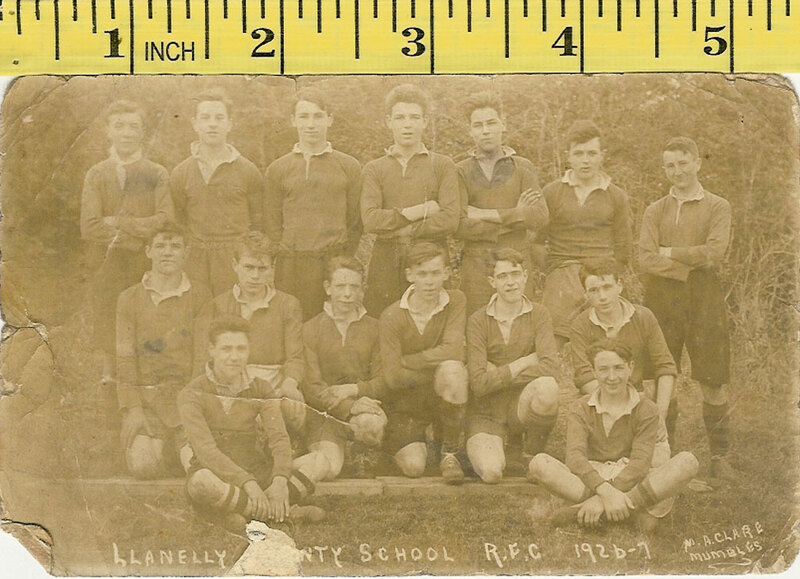 A Llanelly (Wartime) Rugby XV postcard, used, dated 18/3/45. 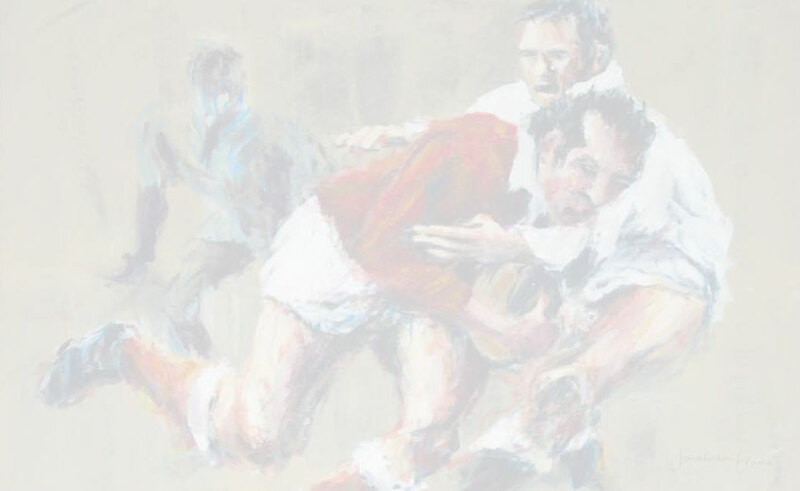 A lengthy message mentioning AC Beamish & WE Jones, written and signed by Ivor Jones (16 caps for Wales 1924 - 1930 & 1930 British Lion, IRB Rep 1960s, WRU President 1968/9 The card has an uneven edge at the top, we believe it was hand cut in the interests of economy at the time. 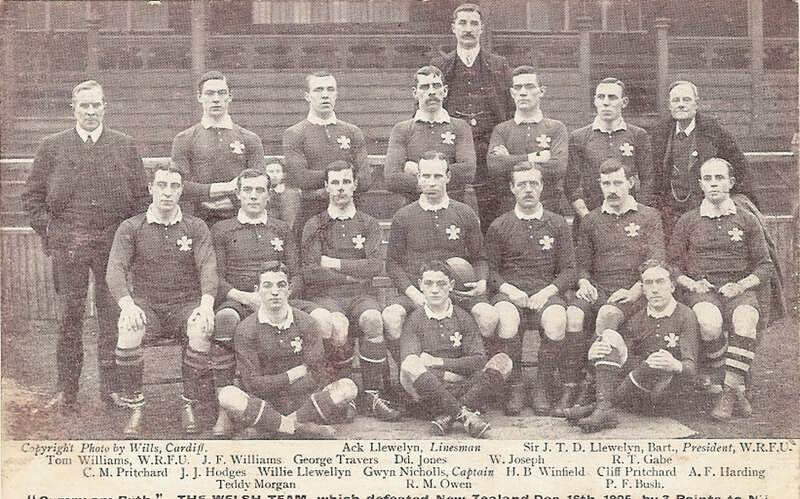 An ideal opportunity to obtain a rare Llanelli postcard and international autograph. Picture of LeBoulevard des Italiens, Paris . 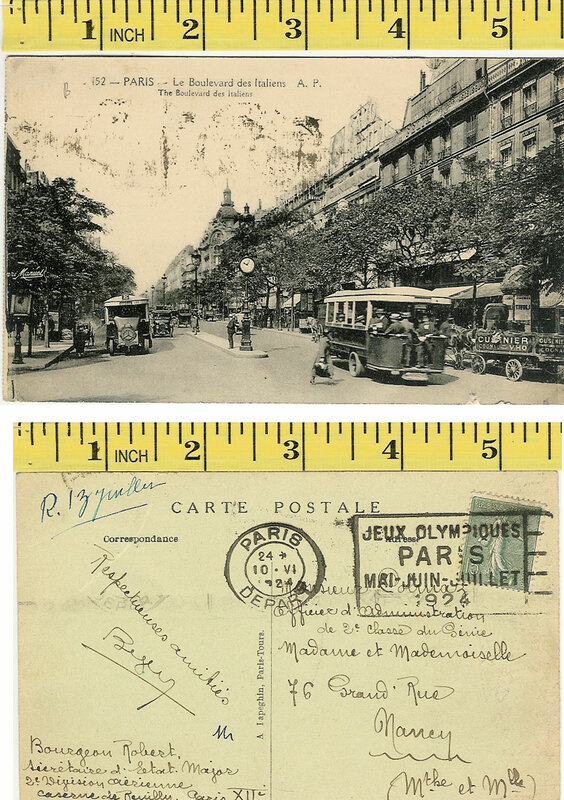 Postally used, dated Paris 10/11/1924 , also Stamped with Olympic Games postmark. The front is marked where the postal ink has come through, and there is a tear on the top right. 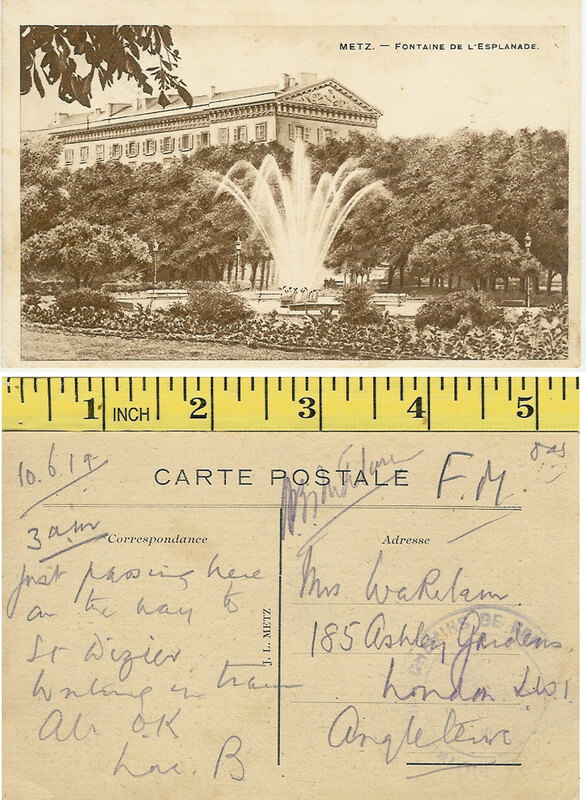 HBT Wakelam - rugby & cricket commentator, a postcard of Metz - Fontaine de la Esplanade with pencil notes to his mother, Wakelam gave the first ever radio commentary of a rugby international when he called the England v Wales 1927 match at twickenham and the first ever cricket televised commentary England v Australia 1938 at Lord's, sold together with photocopies of the reverse of 2 related cards.